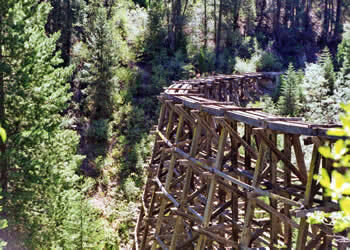 The Bourland Trestle was built in 1923 by the West Side Lumber Company which owned a lumber mill in the small town of Tuolumne. As lumber became more and more in demand, tracks were built deeper into the forest and thus they reached Bourland Creek. It was quite a feat to construct this trestle ... 75 feet above the creek and over 315 feet to stretch across to the opposite side. There were several other trestles built around this time that were just as important and had such wonderful construction accomplishments for that era. The West Side Railroad continued using this trestle until the late 1950s and finally in the mid to late 60s, the tracks were removed. Fortunately for many of us who viewed this marvelous structure, the Bourland Trestle remained intact until 1997. Heavy rains caused the high water in Bourland Creek to weaken the supports and then in the following year the middle part of the trestle collapsed. Since then more of the trestle has fallen leaving only those portions of the trestle attached to land. Because of its weakened condition, it is not safe to venture onto any of the structure. However, it is well worth taking the ride along what once was a narrow-gauge railroad and witness for yourself the remains of a marvelous trestle. You won't be sorry! Directions from the Summit Ranger Station: To come shortly.